Those with long memories may remember an interview we did a little while back regarding Ether Wars, a dice rolling area control game from Spain. You also may remember we also did a couple of interviews with Burning Games, also from Spain, regarding their card based RPG Faith. 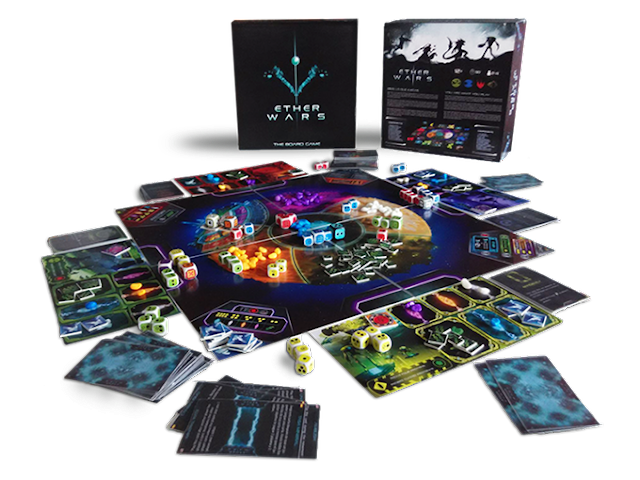 Well Ether Wars didn’t do very well first time around but the developers have teamed up with their fellow countrymen to come bring back the sci-fi dice game to Kickstarter. I had a little chat with the development team regarding how to do a Kickstarter the second time around. In case people missed the first Kickstarter, give us an overview of what Ether Wars is? Ether Wars is a dice rolling game of worker-placement and area control in which two to four players with asymmetric powers fight for control of the Ether. It has been play tested in dozens of conventions and it is returning to Kickstarter this November 22nd in a combined effort from EtherDev, the designers of the game, and Burning Games, their publishing partner. In a market full of games (takes a sideways glance at the shelf of unplaced games), what makes Ether Wars unique? If we had to point out only one thing, we’d say the sweet spot between American and euro style of the gameplay. 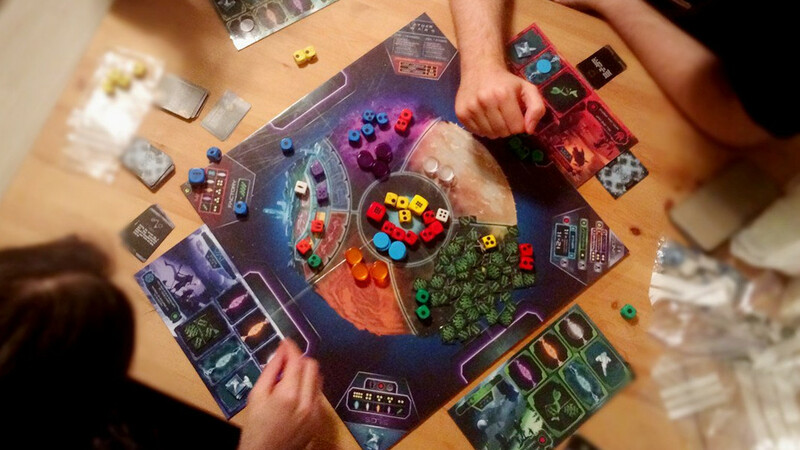 It is in its essence a worker placement game, but placing your dice and then rolling them to extract resources; and more often than not, attacking each other, adds a layer of theme and player interaction to the gameplay that is very attractive to us. I saw you were demoing Ether Wars at Essen this year, what was the feedback like? We were very lucky in that department. When the German crowd, always polite but first and foremost really straightforward, gives you consistently excellent feedback, you know you have something special in your hands. 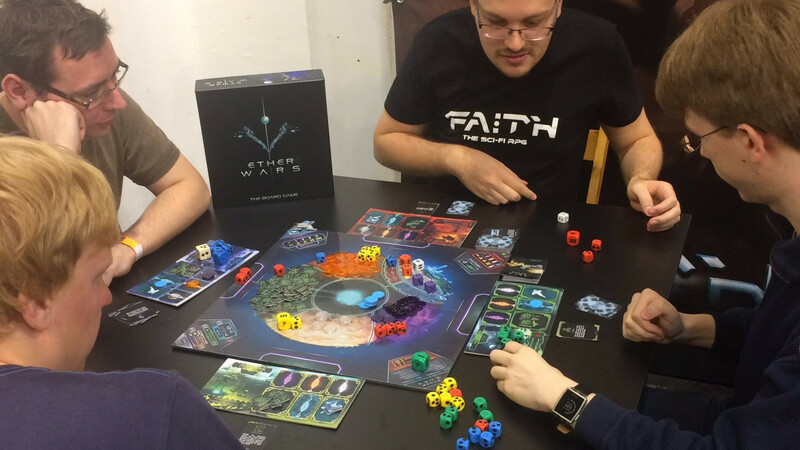 This is Ether Wars second attempt at Kickstarter, what went wrong? Lack of outreach was the number one issue. The high goal was number two. When you mix both, you have a situation where you don't get enough backers to reach your goal. This time around we have teamed up with a publisher called Burning Games, who have successfully funded two RPGs in the past. They've been able to lower the goal quite a lot, and now we are confident we have all the missing pieces. It's been over a year since we first saw Ether Wars, and since then we've had hundreds of new games released. What makes Ether Wars unique and have you had to change the design based on new games that have been released since your first Kickstarter? 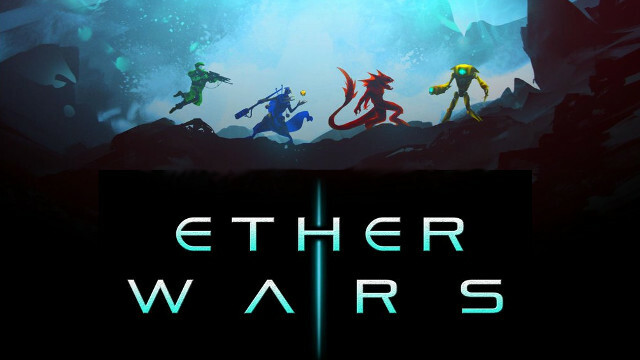 Ether Wars stands out for its robust resolution system. It is based on rolling dice, but players have the chance to influence the outcome of these rolls by "charging" their dice via asymmetric player powers, which results in very thematic dice battles. As for the changes, what has improved the most is the "tightness" of the rulebook, influenced by years of ever-improving releases from the top companies in the board game business, as well as some of the graphic design. Ether Wars uses a lot of dice, I've heard from other game publishers that custom dice can add a lot to the cost, what have you done to mitigate this cost? The main cost comes from making different designs that are also in different body colours. What we did was make designs across factions the same but in different colours to tell them apart, and designs across mercenaries different but with the same body colour to keep them all in the same mould. You've partnered up with fellow Spanish game developers Burning Games. How did that partnership emerge and what have Burning Games brought to the development of Ether Wars? We met at an event in Santander, northern Spain, a couple of years back. They were demonstrating their RPG Faith, and we were promoting Ether Wars. They really liked the game when we showed it to them, and after our Kickstarter didn’t fund we got back in touch, and the rest is history. They have helped improve the presentation of the game and the campaign, as well as edited all texts and provided their logistical expertise. We are confident that with our combined fan bases and a refined game with better graphic design, better editing and a better campaign we will be able achieve the success Ether Wars deserves. Burning Games have been doing the convention circuit, will we get to see you and Ether Wars at the UK Games Expo this year? Many thanks to the Ether Wars team for answering my questions – you can go back Ether Wars on Kickstarter now.